Regular fs laser provides possibly tunable photons only whithin the broadband of the cristal used, to the detriment of the pulse duration. Femtochemistry requires photon excitation on the absorption band of the studied system. The challange is also to tune the wavelenght of the pump photon, keeping the feature of the laser in term of pulse duration and with a resonable energy. 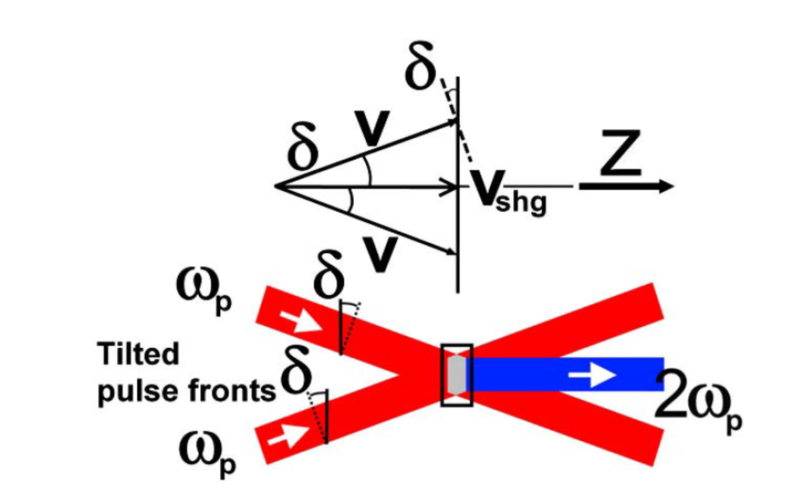 We report on 400 nm broadband type I frequency doubling in a noncollinear geometry with pulse-front-tilted and chirped femtosecond pulses (λ0=800 nm; Fourier transform limited pulse duration, 45 fs). With moderate power densities (2 to 10 GW/cm2) thus avoiding higher-order nonlinear phenomena, the energy conversion efficiency was up to 65%. Second-harmonic pulses of Fourier transform limited pulse duration shorter than the fundamental wave were generated, exhibiting good beam quality and no pulse-front tilt. High energy (20 mJ/pulse) was produced in a 40 mm diameter and 6 mm thick LBO crystal. To the best of our knowledge, this is the first demonstration of this optical configuration with sub-100-fs pulses. Good agreement between experimental results and simulations is obtained.